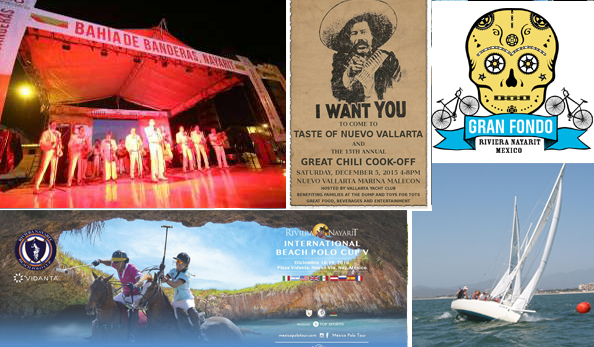 The December events include the 4th Taste of Nuevo Vallarta and the 16th Chili Cook-Off, the 2nd Gran Fondo Riviera Nayarit, the XXIII Baja Ha-Ha / 5th Sailors’ Splash, the 27th Anniversary of the Bahía de Banderas, the V World Beach Polo Cup, the 11th Sinergiarte Festival and the Pee Wee League. One of the elements that distinguish the Riviera Nayarit from other tourism destinations is the amount of events that take place here in during the year and December is chock full of headliners that will end 2016 with a flourish. And don’t forget: this last month of the year brings with it the festivities in honor of the Virgin of Guadalupe, which are held just about everywhere. These two events take place in the Vallarta Yacht Club in Nuevo Vallarta, both showcasing the culinary pleasures of the Riviera Nayarit. On Saturday, December 3rd in the afternoon attendees will be able to sample all kinds of dishes and cooking styles. Both events are fundraisers for the Families of the Dump charity. The Gran Fondo Riviera Nayarit is the most important long-distance bicycle race event in the region. Now in its second year, it offers a challenging route from La Cruz de Huanacaxtle to Sayulita and back. For the fifth year in a row the Destination will host the Riviera Nayarit Sailors’ Splash 2016, a nautical rally that coincidentally takes place on the XXIII anniversary of the Baja Ha-Ha. Between 120 and 150 boats will be arriving at the Marina Riviera Nayarit in La Cruz de Huanacaxtle for this impressive show of sails. Banderas Bay celebrates its founding as a municipality with all kinds of events civic, sports, artistic and cultural to commemorate the history of this beautiful seaside town in the Riviera Nayarit. The success of the World Beach Polo Cup has made it one of the Riviera Nayarit’s signature events and it’s here to stay. This year they moved the date to December, much to the delight of the high season visitors. The Colectivo San Pancho in the Cultural Capital of the Riviera Nayarit organizes this grand artistic and cultural festival around a theme that changes from year to year. The 2016 Pee Wee League Surf Circuit has begun in the Riviera Nayarit. After stops in San San Pancho it returns to Sayulita to end the year in a search for new surfing talent.